1 of 2 Heat oven to 300 degrees. 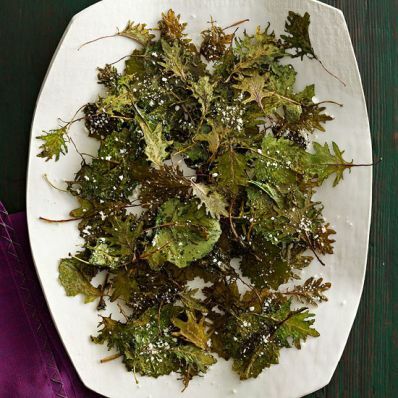 In a large bowl, toss kale with oil and salt. Transfer to 2 baking sheets in a single layer. 2 of 2 Bake at 300 degrees on the middle rack for 25 minutes or until kale is crispy. Gently remove chips from baking sheets with a metal spatula; toss with cheese. Store in an airtight container. Per Serving: 1 g sat. fat, 1 g fiber, 126 mg sodium, 58 kcal cal., 2 g pro., 4 g carb., 4 g Fat, total, 2 mg chol.